Beautiful Asymmetry – Short Hairstyles for Fine Hair – Get it here! Cool, trendy yet effortlessly casual, this hairstyle with a unique asymmetric feel can really transform the way you look and feel. The longer shaggy tresses on one side of your face contrasted well by the tapered strands on the other side beside the ear complement each other perfectly to give a vibrant feel. The casual asymmetric parting of the hair into two contrasting parts adds an enhanced feel of modern styling. Blow dry your hair smooth and style it to the sides giving it the perfect asymmetric feel. Smooth out strands further with a flat iron. Use a styling product to define the contours well and add texture to the final look. This hairstyle can be best implemented on faces that are oval, round or square in shape as they get a distinct proportionate feel. Hair ranging from thin to thick in density with naturally straighter strands looks best with this style. This hairstyle is unmistakably smooth and gorgeous looking with an element of glam added to it. The above the shoulder and slightly parted at the side hairstyle with wavy bangs spices up your look with a retro feel to it. The hair is curled throughout and styled directed back away from the face which effectively enhances the beautiful features on your face. Charlie’s Angel – Short Hairstyles for Fine Hair – Get it here! Part hair to one side and give the partition your desired contour. Use a medium sized curling iron and feather back the hair directed back away from the face. Using the same iron, flip back the bangs and add a curly feel to the entire length and volume of the hair. The minimal layering helps the hairstyle to rank among the best styles for thin hair. The curly look adds volume which makes the hair look fuller. 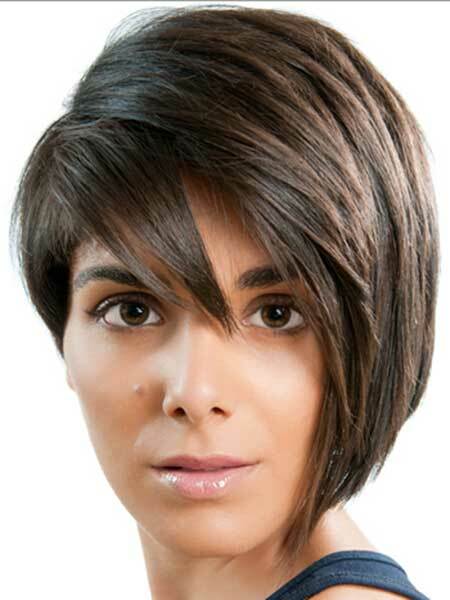 Thin faces with narrower features would find this hairstyle ideal as the volume hides the narrow features of the face. Fly Girl – Short Hairstyles for Fine Hair – Get it here! Defy the laws of gravity with this flamboyant hairstyle which reflects the free spirit of womanhood. Ideal for fine hair, this swept up style makes your hair look flying with the wind. Cut short at the nape, the hair gradually increases in length moving up and towards the front. A perfect hold makes the style appear bold and beautiful. Apply your preferred styling product to damp hair for giving it a good hold. Blow dry your hair styling it upwards and back as much as you can. Add a rounded and finished look to the hair on top using a smaller round brush. Run pomade across the strands to make it more vertical and stand up before finishing off with a spray to hold the look. Face types with rounder features including heart shapes can adapt this style well. Thin or thick, hairs of all densities would suit this hairstyle perfectly. Short Hairstyles for Fine Hair – Get it here! This hairstyle is the perfect one for an absolute voluminous feel if you have finer strands of hair. This style sports a slightly parted look with all tresses of one definite length flowing down in the form of smooth waves that further give a look of extra volume. Hair on the sides is drawn towards the face, highlighting its beautiful features. Wet your hair applying your favored styling product. Use large round brush to blow dry the hair. Apply some thermal protection to your hair. Wrap sections of your hair with a large sized curling wand. Finish off applying a finishing spray giving shape to the final style. The remarkable smoothness and unmistakable simplicity with which the hairstyle enhances facial details can make any face type implement this with élan. Low to medium density hair with natural waves or curls is best suited. Perfect Part – Short Hairstyles for Fine Hair – Get it here! This soft and delicate hairstyle is unique in the way it looks owing to a striking appeal. 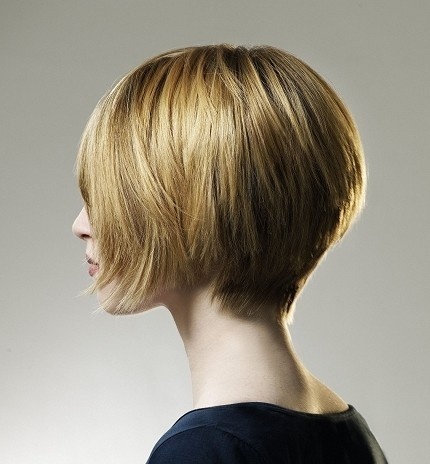 The style with a tapered neck blends up sharply to short layers at the top which help in volume enhancement. The tresses at the front are kept longer to highlight a gorgeous bang that frames the contours of the face beautifully. While your hair is wet just after a shower, use your fingers to give form to a deeper side part and arrange the hair exactly the way you want it to look. Blow dry hair to remove excess moisture. Using a flat iron smooth out the bangs and front tresses to add shine. Use your favorite styling product to add texture to the finished look. This hairstyle is best suited for faces that are a little on the rounder side like oval, heart and round shaped ones. Hair of all densities is good enough along with ones which are naturally straight or wavy. Stacked Bob – Short Hairstyles for Fine Hair – Get it here! The stacked look when used with a bob gives a cool yet dramatic look indeed. This bob has chin length stacked textured cut with medium length layers. Smooth side bangs coupled with a solitary blond streak adds the element of interest in the style. A great look for fine haired ladies willing to sport a smooth and edgy look. Detangle hair after shower and part it to one side of the face. Blow dry your hair with a medium size round brush. Bevel the lower ends while drying to give that flipped and voluminous look. Heart and round shaped faces look best with this stacked chin length bob. Hair ranging from low to medium in density is best besides hair that is naturally straight. Swept Look – Short Hairstyles for Fine Hair – Get it here! A curly bob to say the least, this hairstyle draws attention to your beautiful face and adds unmistakable grace to your appearance. The curled back hair genuinely gives a glamorous touch to your beauty. The uneven and asymmetric parting with the tresses flowing smoothly all over, gives a voluminous feel to your hair. Always a hit among hairstyles for women with fine hair. Apply some thermal protection product to dry hair. Curl sections of your hair vertically using a medium size barrel directed away from your face. Finish off the style with finesse with your favorite finishing spray. This hairstyle with its unique universal appeal and smooth looks can suit any face type with ease. The bouncy feel adds beauty to every face it is styled upon. Hair with low to medium density is best suited for this style. Teased Up – Short Hairstyles for Fine Hair – Get it here! Tease up your hair to give it this unique hairstyle that can help hair of any texture to adapt effortlessly to a wide range of hair types. Since teasing adds instant volume to the hair, the hairstyle gives a much needed adaptability option to the wearer. The volume on top of the head as well as the smooth side bangs with soft curls accentuates the softer feminine side of ladies. Curl specifically the mid shafts till the ends of hair sections. Tease the hair near the crown area. Set the teased look on top with your favorite firm holding spray. Finish off the rest of your hair styling it with a flexible hold spray. The volume on top gives the illusion of the face being longer than usual. Faces with wider shapes and density ranging from low to medium would look the best in this hairstyle. Wavy Bob – Short Hairstyles for Fine Hair – Get it here! This bob hairstyle is trendy and offbeat with an uncommon textured feel that does wonders to your face. The hairstyle is cut near the jaw line with textured layers that lend a feel of softness and waves that further alleviate the soft appeal. The layers in their wavy textured look add the illusion of extra weight to your fine hair appearing fuller than ever thanks to the feel of extra volume. Part your strands to each side and blow dry your hair. Using a paddle brush, remove any excess moisture to give your hair a sleek feel. With an inch long curling iron, curl the ends of your hair. Break the mingled curls running your fingers through your tresses and give it a final tousled look. Heart and square shaped faces are ideally suited as the hairstyle perfectly hides the broader details. Thin hair with natural waves and curls are simply great to adapt this style. Wavy Volume – Short Hairstyles for Fine Hair – Get it here! Another bob and yet another way to style this favorite with grace and perfection. Waves act wonders to the look and appeal of the bob and a great option for fine haired ladies willing to wear it short. A side parted and generously wavy form compliments well the subtle charm of a beautiful face. Use your favored styling product to wet the hair. Blow dry hair using round brush. Add a textured feel to your hair using a suitable flat iron. Set the style in your own unique way using your favorite styling spray. The waves on the sides add extra width to the dimensions of the face courtesy an illusion of added volume. This makes it best suited for faces that are longer in vertical length. Low to medium density hair is best suited for this hairstyle.